Hard to believe we’ve entered May! I’m gazing out the window right now, warm breeze wafting in, wondering why the temps tomorrow will turn so wildly in the opposite direction. The thermostat reads 81 degrees. Yet, come morning, we’ll be back at 55, praying the predicted 7-day rain streak doesn’t play out. We’ve been through a tough road this year, Eric and I. Cancer is not something we’d ever thought we’d deal with at our age. It definitely puts things into perspective. The urgency to have children is more pronounced now. Even though Eric’s prognosis is amazing, it’s still something that lingers at the back of our minds. The dark thoughts, the what ifs lurk despite our best efforts to dismiss them. I’ve not really talked about it on the blog but thought I’d better start. It’s a part of who we are and what we’ve gone through. And if I’m going to write for you, for me, then I better be transparent. Otherwise, what’s the point. Right? So here we are, two months to the day Eric had his final surgery to remove the melanoma that took us by surprise. The thoughts that go through a mind in shock are unbelievable. Faced with the real prospect of death is uncomfortable. Scary. Sad. Fortunately, Eric is now cancer free. And while recurrence can happen, it won’t. Not right now. We willed it away and prayed to God. And we believe He’s listening. During all this, I was afraid to bring up the fact that we still had an opportunity to have a child with the help of Birdies for Babies. A crisis was happening and I was selfishly thinking that I (we) might never have children. I questioned whether or not we should call Todd and Melissa Trader and call the whole thing off. Our life was over as we knew it. Give it up lady. Move on. But I didn’t. We didn’t. Eric and I talked through the tears and the anxiety about what we wanted to accomplish if we had limited time. We want to have children. Together. And that puts us in a wonderful position – because Birdies for Babies is still on the table! We didn’t call it off but rather relayed to Todd and Melissa what we were going through. They have prayed for us and they understand and are even more determined to help us. I’ve reached out to the clinic in Ohio (Institute for Reproductive Health) where many of the Birdies for Babies recipients have gone on their journey. We couldn’t be more excited! I called just a few moments ago to leave a message about setting up a consultation and getting the paper work started. The weather tomorrow, a cancer diagnosis, a bad day at the office. It’s all relative. It is part of our larger experience but these things do not define us. Instead, we are looking forward to a wonderful future with little Eric and Jens running around! More details to come as we talk with the clinic and ramp up for Birdies! Eric and I are embracing a plant-based diet. Yep. That’s right. The way we figure it, we might not have a problem with infertility if we attacked it from a nutritional standpoint. This isn’t the only reason we are changing by any means. And we don’t feel that nutrition issues are the sole cause of our infertility. Far from it. However, the last few months we have struggled with a different medical issue which has forced us to consider the benefits of healthy eating. Not just a once a week thing but a real life style change. Wow! Creating health from the inside out – what a novel concept! Fortunately for Eric, he grew up eating things like whole grains, vegetables and a variety of meatless options. But he too has veered. Straight towards McDonald’s and Dunkin Donuts. (Sorry Eric!) But seriously, it’s easy to grab processed foods and quicki meals. It’s convenient. It makes lives easier – for the short-term. But we’re learning as we go. We read a lot. We talk to other people who eat the way we want to eat. We try different recipes. At the grocery store, we bypass the boxed macaroni and think about how we might be able to recreate the same dish in a healthy way. We are slowly but surely changing the way we think about food. 1. SUGAR is in everything from fruits and veggies to packaged products. The white refined stuff is what you want to watch out for. Read labels, and keep your sugar intake at a minimum. 2. Stick to 100% whole grain products. In the US, when wheat is refined, approximately 40% of the best stuff is stripped away along with a ton of nutrients like B1, copper, zinc and calcium. 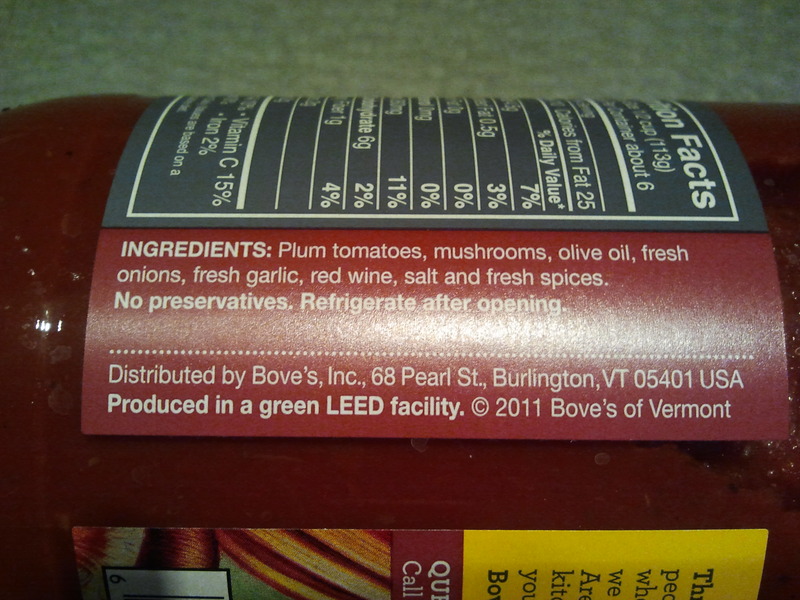 The remaining 60% is processed and “refined”. Examples are white bread, white table sugar, pastries, donuts and white rice. 3. Go green! Green veggies are filled with goodies that help the body boost it’s immunity and fight off infection and disease. Use them in juices, salads, stir fry – whatever you like! 4. Fresh and colorful, fruits and berries have powerful antioxidants that also help fight off disease and keep the body strong. Use them in salads, smoothies, juices, breakfast dishes, etc. 5. Drink lots of water throughout the day. Water flushes the system from toxins and other pollutants and it helps keep us hydrated. 6. Nuts and seeds are worth the investment. They are a great source of protein and are perfect for a quick snack. I had to throw that last one in. We both get cravings every once in a while and we indulge. The point is to try to eat as best as we can most days of the week. 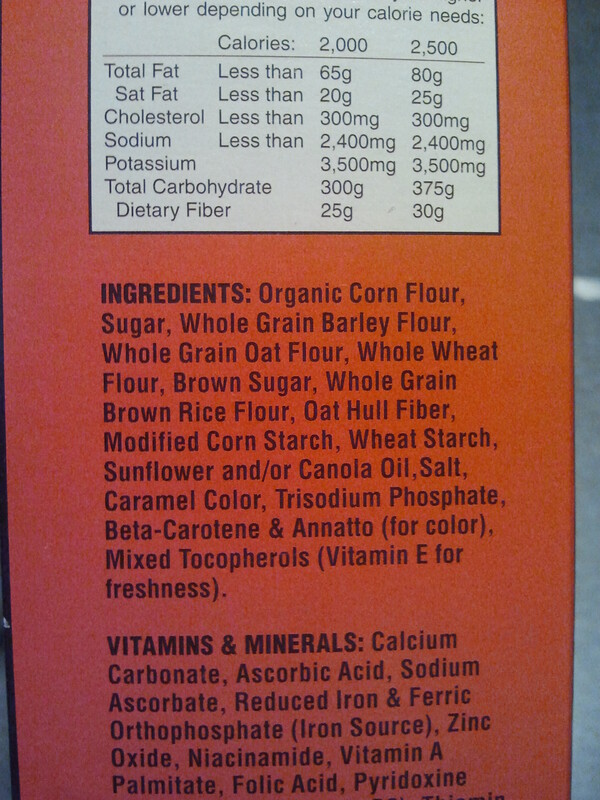 This label is from a multi-grain cereal similar to Cheerios. You’d think it was healthy yet the second top ingredient is sugar. The sixth is brown sugar. 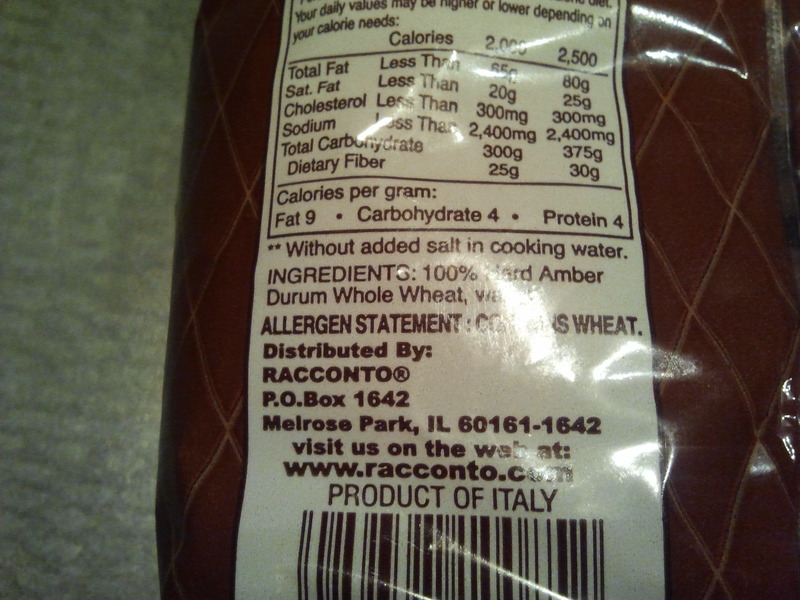 Whole wheat pasta – always check to make sure it says 100% whole wheat. 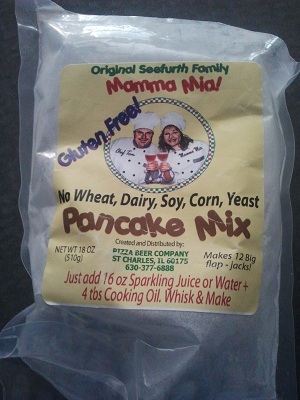 Not wheat flour. Do you have other healthy eating tips you can share? Would love to hear them! October, November and December provide ample opportunities for me to consume more than my fair share of sweets. Cookies, candy, cookies. More candy. It’s ridiculous really. And equally so that I have seemingly no self-control. In fact, since last year I’ve gained at least 5 or 6 pounds. Very unwelcome I must say. If these items had lots of Vitamin D I’d have no deficiency whatsoever! 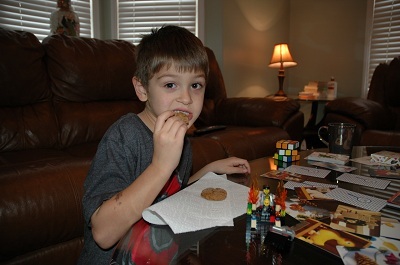 Sunday I had the nephews over for cookie baking and copious amounts of fun. I’m really a bad Aunt though. I provided snacks. Random snacks. I offered the kids a piece of crispy turkey bacon first followed by a glass of soy milk. 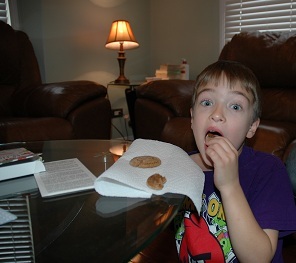 A little nibble of cookie dough (Don’t tell Mom!) was thrown in before they exclaimed, “We want a snack!” Weren’t those snacks? Zack, my oldest nephew, spotted a photo of a shrimp on a can of Pam. “I love shrimp,” he said. “I have some shrimp,” I said. So I offered them two strawberries and two pieces of shrimp each. It should have stopped there but the cookies needed to be tested. Cookies just out of the oven are warm and yummy and, well, yummy. So I gave them each two cookies and another glass of soy milk. My Lord, I will NOT be a good mother. I will kill my kids with love and sugar, I’m sure of it! But I guess it could be worse. On another note, I wanted to share a link to a story sent to me by a friend. The Chicago Tribune recently interviewed Colleen Wagner Coughlin, a Chicago embryologist operating a lab called aParent IVF for Fertility Center of Illinois. According to the article, she was fascinated with animal reproduction from a very early age. Her mother, who must have been very cool, let her first breed gerbils, then mice, then rabbits. Wow. I bet she got lots of cookie dough! Eventually Coughlin made her way into human reproduction and has been there for the past 27 years. In fact, her lab, aParent IVF, according to the article, is extremely successful and has helped see 25,000 babies into the world! She sounds like an amazing woman with a passion for helping others. I will be adding a few more blogs to the blog roll in the next week. Until then, eat lots of cookies! In the last month I have had several blood tests to determine the cause of my extremely low alkaline phosphasate levels. The most recent tests done about two weeks ago. Unfortunately, my GP left the practice during this process and thus my blood work has taken a backseat. Her peers are scampering to deal with her patient list and I’m last in line. Still though, it would have been nice to get a phone call to let me know my results were in. That I wasn’t dying of malnutrition or other strange ailment. No. Instead, more than a week after my tests were done, I had to call the practice and ask for the results. A nurse checked my chart and assured me that all the blood tests were within normal range and that the doctor (the new one) would like to check in with me in three months time. I made a critical mistake in my relief. I didn’t question the nurse further about the results. I should have asked for the doctor. I should have held the doctor accountable for getting back to me with tests that I had been waiting on. I know they are busy. I get it. But the doctor should still have the courtesy of calling a patient. What’s more, the results posted on the practice’s patient portal, were normal save one critical test. I have a severe vitamin D deficiency with a current blood level of 15 ng/mL. The nurse made no mention of my vitamin D levels. Again, I should have asked to talk to the doctor. I urge all of us to keep on top of our doctors so that you are “in the know” at all times. A vitamin D deficiency can cause all sorts of issues including increased risk for bone fractures and osteoporosis. And, from what I’ve read, infertility. In fact, Dr. Joseph Mercola, a well-known alternative health physician out of Hoffman Estates, IL, posted an article in february of this year addressing this very issue. He talks about the importance of vitamin D, not just for women’s fertility but for men’s as well. Check out the article here: The Vitamin That Has Been Show To Dramatically Improve Fertility. I have also seen articles which say it doesn’t have a significant impact on pregnancy or fertility. Either way, it is worth the research. I plan to call the doctor tomorrow to find out what she recommends. In the meantime I have stocked up on Calcium with Vitamin D3 (it is said that D3 is what we should be taking – NOT D2.) I checked the label on my prenatal vitamin and interestingly it does not include D3, only D2. Also, fish oil – particularly Cod Liver oil is supposed to be the best source for Vitamin D3. These come in capsule format so check around. Does anyone else have stories about a vitamin D deficiency or other such issue? Would love to hear from you! Am I still Gluten Free? Did I really start? Nah. It was a phase I went through for about a week. I have no self-control when it comes to food. This experiment was harder than I thought. The cardboard like consistency of the “wraps” and other “gluten-free” products did the whole thing in. Oh well! On to tastier things! In my last post I talked about Eric and I going to an IVF specialist. I’m happy to say, that day is tomorrow! I am excited but a little nervous. I feel like this roller coaster is about to take off again. It brings back a lot of emotions; not all of them good. Tomorrow’s appointment is with a doctor that came highly recommended by a friend I work with. Dr. Sigal Klipstein with InVia Fertility in Arlington Heights will be reviewing all our files and making her recommendation. An ultrasound is also scheduled. The Dr.’s fee for the consultation is $185 and the ultrasound is $315. These are “self pay” prices. The total package for IVF is $10,600. I need to check and see if the $500 we will pay tomorrow goes towards the overall payment. It’s outrageous to me that this type of procedure is so expensive. The fee doesn’t include storage of frozen embryos in the event we wanted to try again. I don’t know if I should be more incensed. It’s not anyone’s fault that we can’t get pregnant. Why shouldn’t doctors and pharmaceutical companies want to take advantage of that? More power to them. On a more positive note, I also applied for the 2013 Birdies for Babies Golf Outing. Eric and I would be thrilled if we were chosen as the next recipients. The founders will not make their decision until March (the latest) depending on their sponsor’s involvement. Fertility Centers of Illinois has been the sponsors for the last several years from what I know. Maybe they will extend the offer to TWO recipients instead of just one. Mom and I attended this year’s event in September. The event drew so much attention that it sold out! 142 golfers made for a full day of fun in the sun on September 29th. It was amazing to see the support that Jake and Jenae (recipient this year) received and I’m so glad that I could be a part of it. I will keep you posted about tomorrow. Eric will be attending the appointment with me. Maybe there is a way we can afford this treatment through a payment plan! We will find out more. . .
I’ve not thought much about our infertility. Eric and I have been enjoying the cooler temps, whipping around on the motorcycles and generally enjoying life. Every once in a while I think about our childless life and wonder if our status will change. Few things trigger me. A movie perhaps. Or a pregnant woman in a grocery store, hand on her belly as she shops for deli meat and cheese. Recently, I attended an anniversary celebration for a local knit shop. Mom pointed out a pregnant staff member. I asked the young woman if could touch her belly and she said no; she doesn’t let people touch. I felt sad for the briefest moment. She must have her own reasons. If I was pregnant I’d let people touch me. Maybe. Eric and I have talked about what we want to do now that the summer is over. Fall and winter will settle in and we’ll be holed up, waiting for spring to come around once again. I prefer this time of year. Insides of houses transform; Halloween, Thanksgiving, Christmas. Candles with scents like Cinnamon and Harvest Home and Apple Spice are lit, slow cooker recipes are thrown together and time slows. This is the time of year I like to reflect. What have I accomplished? What are my goals? What are OUR goals? I imagine Eric does this in his own way. We’ve decided that we are going to do a round of IVF in January. It’s a scary prospect. A $10,000 to $14,000 scary prospect. I have no idea who we will go with but I have had a recommendation or two. It is daunting to think that even though the money will be spent, there are no guarantees of success. I must stop this negative thinking! 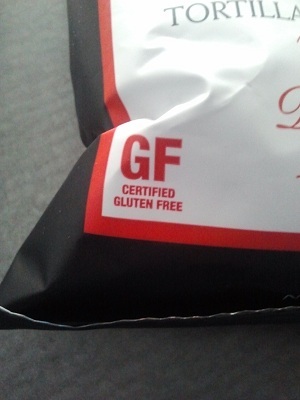 In the meantime, I’ve decided to try a gluten-free diet. Wikipedia says, “Gluten (from Latin gluten, “glue“) is a protein composite found in foods processed from wheat and related grain species, including barley and rye. It gives elasticity to dough, helping it to rise and to keep its shape, and often gives the final product a chewy texture. Gluten may also be found in some cosmetics or dermatological preparations”. I don’t propose to have Celiac disease. In fact, I don’t have the symptoms of celiac. However, if gluten DOES have something to do with infertility, then I’m willing to give this diet thing a chance. Eric is going along with it too. For now anyway. When I told him I’d like to try gluten-free he gave a me a look. When I told him I wanted to clean out the pantry of all gluten-free items he put his foot down. “I’m NOT doing this gluten-free thing forever ya know. Don’t throw away my flour I use to make pizza dough.” Ok. Easy does it. 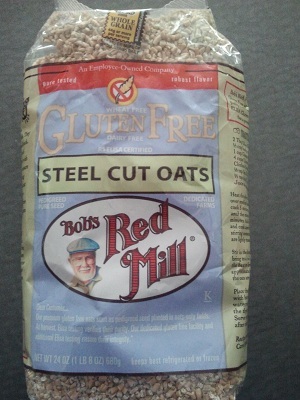 I have had steel-cut oats before and they are tasty. Especially with a little milk, honey and dried fruit or almonds. 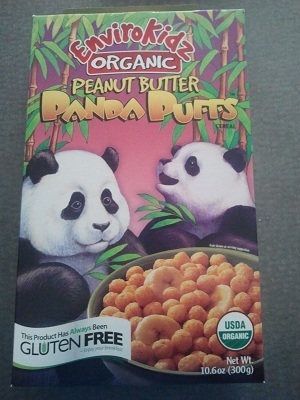 We didn’t have any soy milk so we’ve not tried these yet. Eric had a handful of dry ones and deemed them worthy. Gluten-free pastas and breads are very expensive. I think this little bag cost about $4. 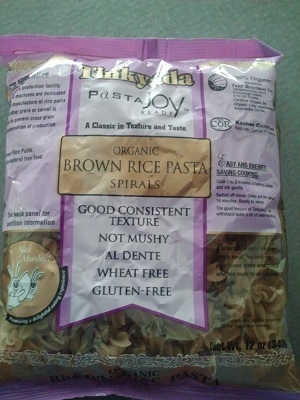 Not what I would normally pay for whole wheat pasta. The texture will be something to get used to. They are not as spongy and chewy as regular pasta. I have a recipe for stove top mac and cheese and I want to try it with these. 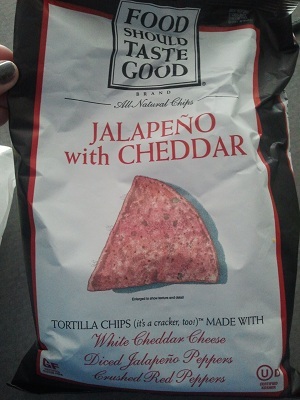 These are actually very tasty. They have a little bit of a bite to them but would go great as nachos or with a favorite salsa. Most salsa by the way is gluten-free. You can google almost anything and found out a yes or no to most products. We made these yesterday and they were delicious! Not as good as the whole wheat pancakes I make but still pretty good. We had soy butter and basic syrup. I would usually put a pure maple syrup on or maybe some honey. I also added cinnamon to the batter. They were super easy to make up. This is the Gluten Free symbol to look for when you are purchasing prepared foods. I’ve read that you should keep all GF products separate from gluten products especially if you are or might be Celiac or have a gluten sensitivity. Apparently gluten can even stick to door handles (think fridge doors) and the like. Crumbs in the peanut butter, etc. You get the idea. Lundberg’s makes a GF line of rice cakes as well that are pretty good. I bought the apple cinnamon last week. In the morning I top it with peanut butter and honey. Yum! I will be posting some GF recipes here as well. If you have any thoughts or ideas for my blog please let me know!